Bart Ouvry, Belgian Foreign Department: "We have a great number of victims"
An investigation has been launched into the rush-hour train collision which killed 18 people outside the Belgian capital, Brussels. Rescue workers spent all of Monday searching the twisted wreckage for victims, fearing that the death toll in the head-on crash could rise. Identification was proving difficult for some victims, officials said. They had been taken to 14 hospitals in the greater Brussels area, officials said. Rescue crews had to deal with freezing temperatures and blizzard conditions when the crash happened about 0830 local time (0730 GMT) on Monday, near Halle, on the outskirts of Brussels. Passenger Sebastien Duckers, who hit his head when he was thrown forward in the crash, told the BBC: "Everyone was frightened and there was a lot of crying and screaming. We were all in a state of shock. "There was broken glass scattered around the carriage." He saw one person trapped under wreckage. The cause of the crash was unknown, but the governor of Flemish Brabant province, Lodewijk De Witte, said one of the trains seemed to have missed a stop signal. Belgium's track operator Infrabel said it was difficult to speculate on the cause at this stage. Belgian National Railways spokesman Jochen Goovaerts said his agency was awaiting the outcome of the investigation before discussing the cause of Monday's accident. 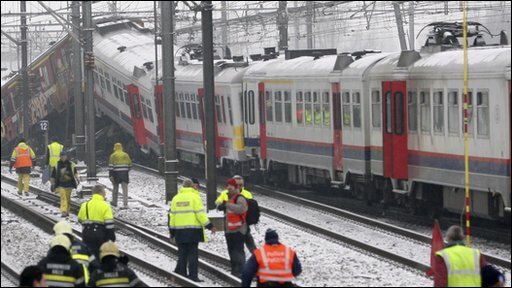 The crashed trains may not be completely removed from the tracks for two or three days, the Brussels public prosecutor's office said, according to Associated Press news agency. Cancellations of Eurostar trains between Brussels and London, plus Thalys trains to France, Germany and Netherlands were extended into Monday as their tracks run past the crash site. King Albert II visited the scene in the afternoon with Prime Minister Yves Leterme, who had cancelled a trip to Kosovo moments after landing in Pristina. Infrabel said one train had been going from Leuven to Braine-le-Comte while the second train had been travelling from Quievrain to Liege. 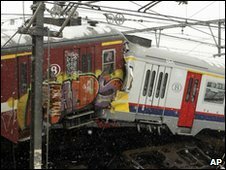 It was Belgian's worst rail accident since 2001 when eight people were killed and 12 were injured in a head-on collision between commuter trains outside Brussels. Are you near Brussels? Did you witness the incident? Have your travel plans been disrupted? Tell us your experiences using the form below. Send your pictures and videos to yourpics@bbc.co.uk, text them to +44 7725 100 100 or if you have a large file you can upload here.